I wanted a washing machine delivered on a Wednesday, when I am at home. 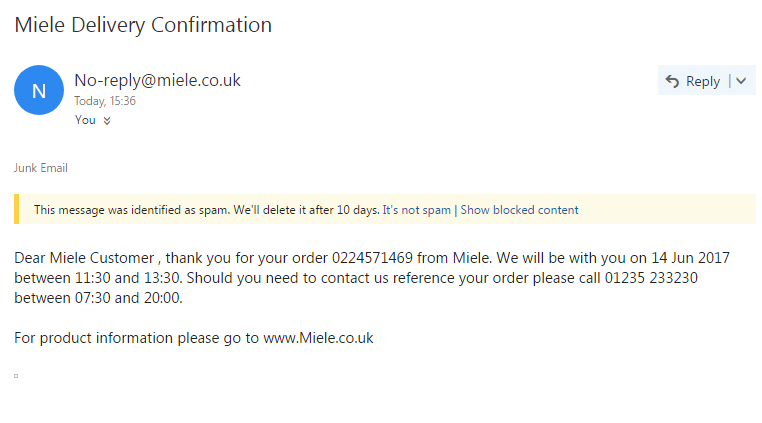 I rang up Miele on Saturday 3 June an arranged for one to be delivered on 14 June. They sent me many texts saying it would be delivered between 1130 and 1330 on 14 June. They sent me an email saying it would be delivered between 1130 and 1330 on 14 June. On 14 June they rang me to arrange delivery. I said they were due to deliver between 1130 and 1330. They said they had not been able to find one or had entered two orders or something. Maybe I could have one by special courier if I waited in a couple of days. I said it would have been better to let me know beforehand. I cancelled the order. Their washing machines may be perfectly adequate. It looks like I will never know now! The curves in the pic are f(x) and f'(x). Question: The function is f(x)=x+√x. Can you find its min or max value? If you calculate f'(x) and put it to 0, you get x=1/4. But draw the curve and there is no such max/min there. One suggestion: Clearly f'(x) has two asymptotes at x=0 and y=1 and so can never be 0 for any real value of x. But why does differentiating lead to the result x=1/4? I agree that f(x) = x-√x has a clear minimum there, but it’s a different function. My answer was that since there’s an infinity at x=0 f'(x) is undefined, but I’m not convinced that’s the answer. OK, so √x is defined as the positive value of x^(1/2). x = √x√x where x, √x >= 0.
if f'(x) =0, then √x = -1/2. But √x is >= 0 by definition, so there is no solution. Let’s try to be a little more systematic while staying within the bounds of high school maths. and we choose c to be either 0 or 1. But since √x is positive, c must be 1 rather than 0 for this to have a solution. So by accepting a solution here we force the original function to be g(x) = x – √x.